Great to see so many old friends, and making some new friends at Portland’s Stumptown Comics Fest 2012. 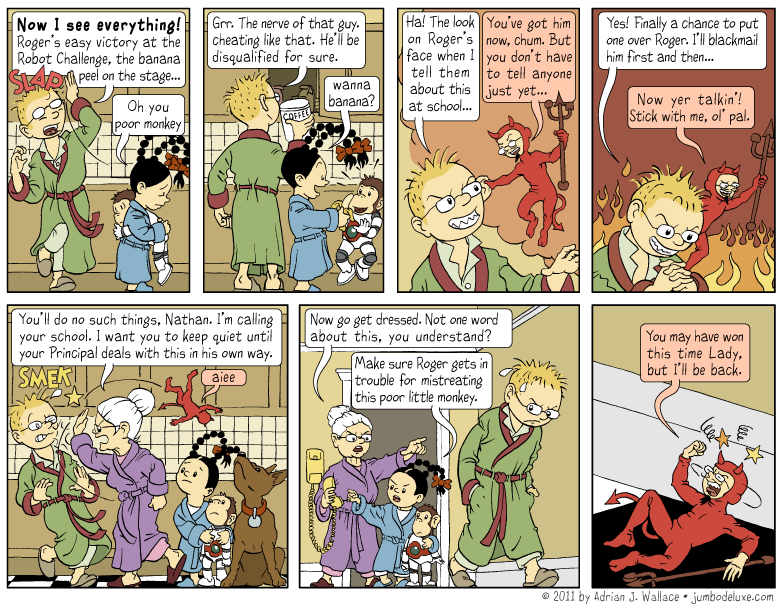 With the appearance of Nathan’s Shoulder Devil, I’d like to encourage Jumbo deLuxe readers to balance things out with Becky Hawkins’ Shoulder Angel, a recurring character along with Becky herself in French Toast Comix. This isn’t your typical autobio strip: for one thing, Becky’s day job is playing saxophone on a cruise ship, and –as I mentioned before– she’s got a shoulder angel. Becky regularly documents her globe-trotting adventures in vivid watercolor paintings as a sort of unfolding travelogue among witty, gently self-deprecating comic strip narratives. Naturally, small childrenand animals can see shoulder devils. Also naturally, shoulder devils wear vaudevillian onesies. That’s right! In the Jumbo deLuxe Universe, all sorts of vaudevillian clichés are REAL.